Twitter chat co-hosted by Temple PRSSA 8/19! 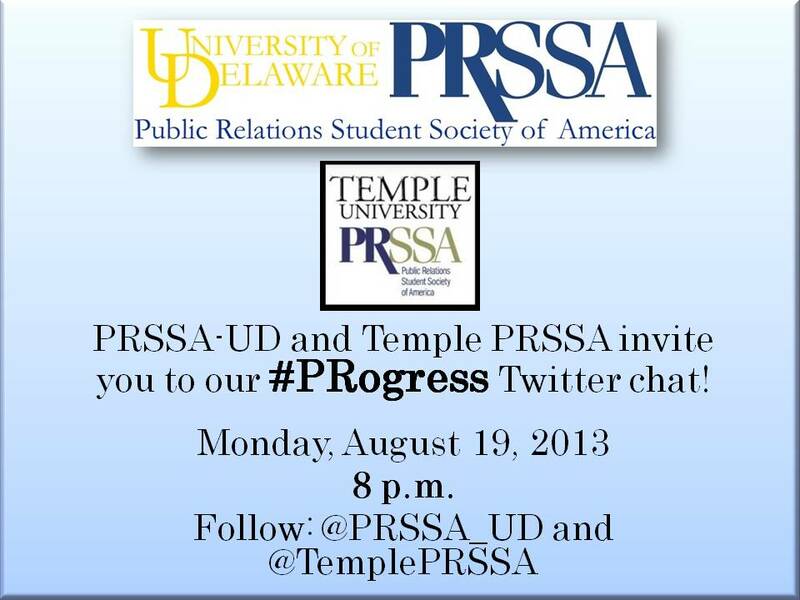 We are inviting all our PRSSA members to our end of the summer Twitter chat co-hosted by Temple PRSSA Monday, August 19 at 8 p.m.
Our “PRogress in Fall 2013” chat will discuss your plans for academic success, goal-setting, overall professional and person progress and how PRSSA can help! Our executive board wants to hear how your summer internship experience will benefit our chapter and how you will manage classes and an internship this fall or in the future. We also want to hear your suggestions on how PRSSA-UD can make Fall 2013 a great semester! See you there! Make sure to use the hashtag, #PRogress, to join the conversation! ← Meet my summer internship.